Yesterday I reviewed Unibroue's 2017 edition of Seigneurial after a four year lapse since the last time I tried the beer. Today I'm checking out Unibroue's Éphémère Sureau (Elderberry) fruit beer as part of the 2017 Unibroue Sommelier Summer mix pack. 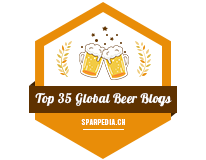 I'm not a fan of Unibroue's Éphémère line, in fact - I'd rather see four bottles of Blanche de Chambly in each taster pack than two bottles of any Éphémère beer but the mix pack is meant to satisfy the beer geeks with La Fin du Monde and Seigneuriale while Blanche de Chambly and Éphémères are for those casual beer drinkers or fruit cooler fans. I think Unibroue doesn't realize that most people who buy the Sommelier mix packs are mostly snobs/geeks as it is. Ah well.. The newest beer in the long line of Éphémères is the Elderberry (Sureau). I've never had Elderberry before so I'm not sure what to expect. 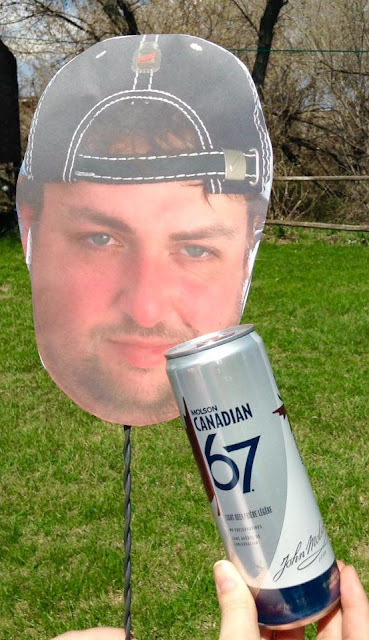 Appearance: Éphémère Sureau pours an opaque and heavy ruby red ale with a lot of yellowish/beige head on top. Like La Seigneuriale, I had to wait a while for the initial head to diminish. Once the head diminishes, it leaves half a finger's worth of yellowish/beige head with no trace of residue on the side of the glassware surprisingly. 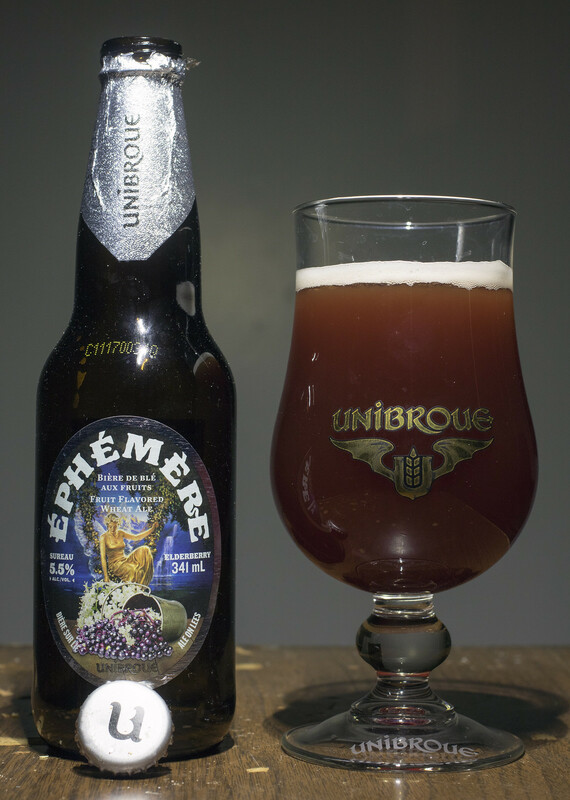 Aroma: This is actually bringing me back memories of 2011 when Unibroue had a Cassis version of Éphémère. The Cassis (Blackcurrant) and Framboise (Raspberry) varieties are the only ones I actually liked to buy so I'm feeling really nostalgic because of the cassis-like notes. The aroma is pretty sharp with a liberal amount of sweet yet incredibly tart fruitiness in it. It's a bit reminiscent of Saskatoon berry but for the most part - cassis. It almost has a sweet Hubba Bubba bubble gum aroma to it, somewhat syrupy, a bit salty, light amount of floral notes, and a decent amount of tartness to it. Taste: It has a floral and herbal flavour to it with the initial flavour reminding me of the herbs used in a good marinara sauce (such as oregano). There's a good deal of saltiness in there which is a surprise, a hint of spiciness hitting the middle of the tongue, a light sweetness with a good deal of tartness that reminds me of the cassis beer. Since it has notes that reminds me of marinara sauce, it does have a good deal of vegetal notes in there that I don't see often in a fruity beer. There's a bit of that Hubba Bubba bubble gum taste to it.. reminiscent of the grape flavour from my childhood. Overall Thoughts: I still wish Unibroue would put in a different beer rather than bringing out a new Éphémère beer every six months. I know there's people who love the fruity beers Unibroue comes out but I'm not one of them. I'll be buying at least two more of this mix pack over the course of the next month or two so I'll be drinking this either way seeing as I don't like seeing beer go to waste. It's surprisingly vegetal with notes reminiscent of cassis and Hubba Bubba bubble gum. Not the worst in the series but doesn't compete with the actual Éphémère Cassis.